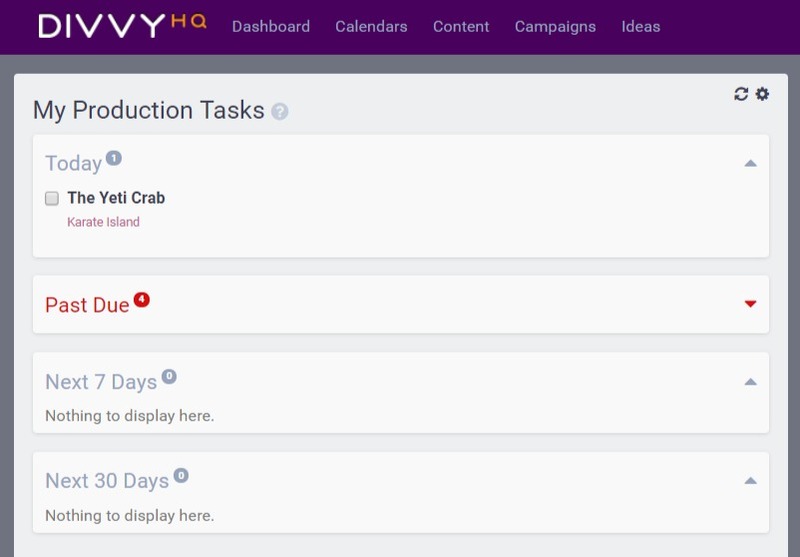 The DivvyHQ 3.0 dashboard brings a fresh look to a familiar layout with major improvements in visibility, efficiency, and usability. Continue reading for an overview of each widget and tips for getting the most out of the new interface. DivvyHQ’s 3.0 Dashboard gives each user a dynamic snapshot of what's due, what's done and what’s happening right now within your Divvy account. 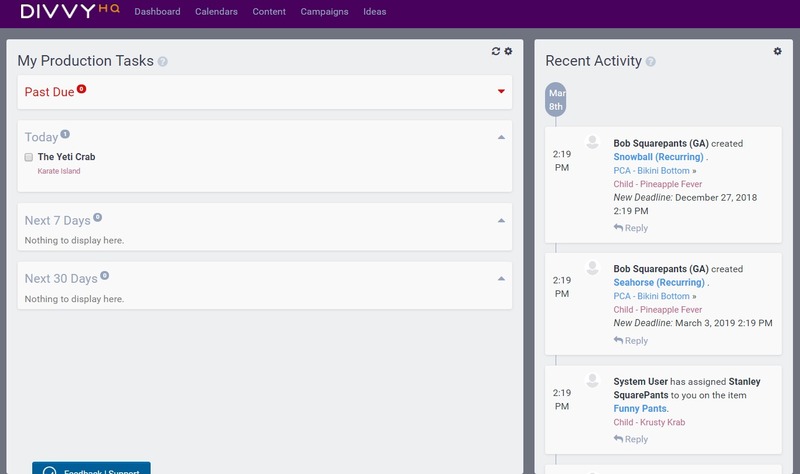 We use the word "dynamic" because each user within an account will likely have a very different dashboard view, based on the content calendars and content projects that are associated to them at any given time. In other words, a Global Administrator's dashboard will encompass all current content projects on all calendars, whereas another team member may only see a few things that are specifically assigned to them. The My Production Tasks Widget - your personal task list. After you work with your Divvy dashboard for a bit, you might start wishing you could rearrange your widgets to better match what is important to you. Well thankfully, you can do just that. Hover over any widget name to proc the grabbing hand icon, click and hold, then drag it over any other column to change its location. Any widget can swap position with another. Maybe you live your life in a task field void (smile, it's okay), so having it in the larger far left column gives you better insight into what needs to be done. Perhaps the Recent Activity widget just annoys you with notifications, no prob, shove that column to the lower right-hand corner, and ignore with glee. Each section in the Published Content, Production Task, or the Content Item Due widget can be customized as well. To do so, simply hover over a section's name, click and hold, then drag it up or down within the widget. Maybe today's tasks are more important to you than those that are past due (or maybe you just want to ignore them ), just drag today's tasks to the top of the widget, so they are front and center. 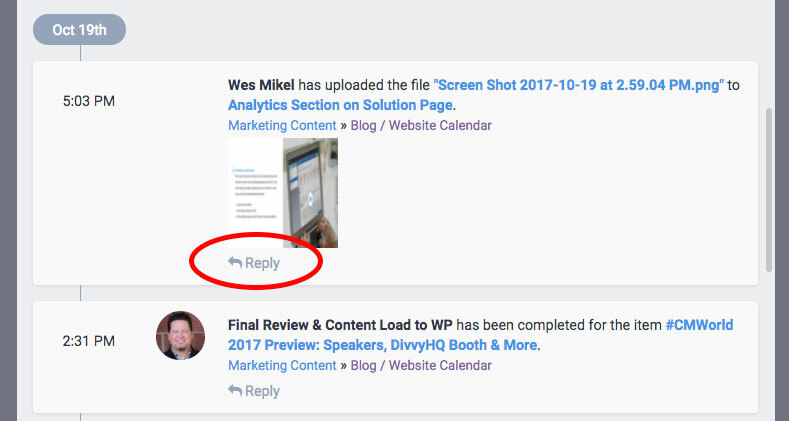 In the event that a particular recent-activity event or action sparks the need for a conversation, DivvyHQ provides this capability within the Recent Activity widget. Simply click the Reply button underneath each update and comment away! 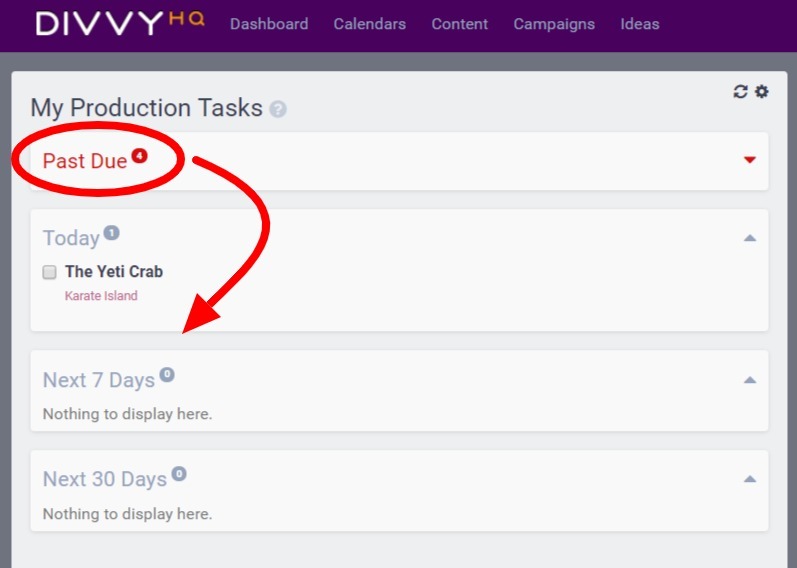 As with most interfaces throughout DivvyHQ, single-clicking a content item's title will open up a preview of the item, giving users a quick snapshot of the item's details and allowing the user to make some edits. If a single click opens a preview, what does a double click do? Glad you asked! Double-clicking a content item will open the content item in the Divvy Sandbox, which houses all details, content and attachments for the content item. 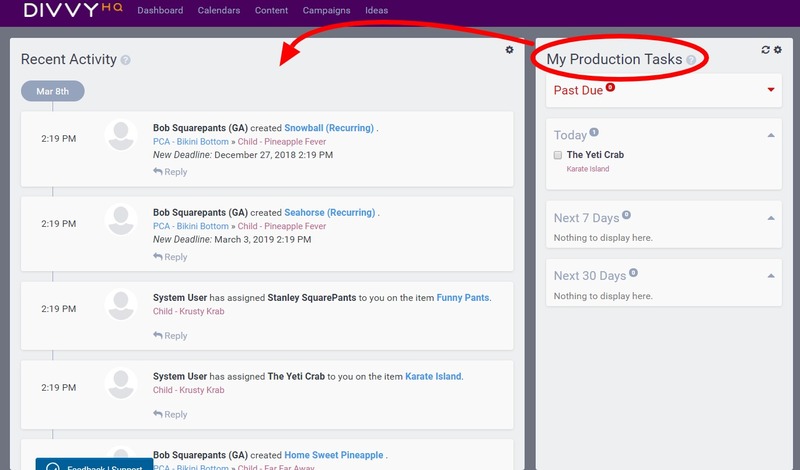 In much the same fashion as above, single-clicking a task in the My Production Tasks widget will trigger a task preview to slide in from the right. 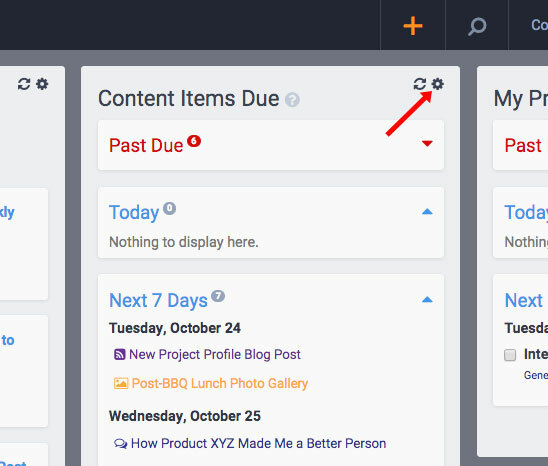 If you need to edit any of the task's details, click the blue Edit Details button in the lower right. To mark a task as done, you can either use the checkbox to the left of each task or preview a task and click "Mark As Done" in the lower left. Divvy's new 3.0 dashboard introduces filtering capability for each dashboard widget. In much the same way as users can adjust and save filtering preferences on Divvy's Calendar and Content interfaces, each dashboard widget can be filtered by date range, calendar and team members. To adjust and filter the results of a specific dashboard widget, click the gear icon in the upper right to trigger the widget's feed settings overlay. We hope you like the new look and experience of the DivvyHQ 3.0 Dashboard. As always, if you have any feedback or need to report an issue, please click the Feedback / Report a Bug button or submit a support ticket.